Yes, I’m finally writing about a Osamu Tezuka anime. Kinda. One of the many, many comics Tezuka drew was Boku no Son Goku (My Son Goku), which ran 1952 to 1959. As the name implies, it was Tezuka’s take on a Chinese novel called Journey of the West, written by Wu Cheng’en in the 16th century. It featured a monkey king (Goku) on a journey with a Buddhist monk and a shape-shifting pig. This story was adapted and retold numerous times. Most famously it was the inspiration for Akira Toriyama’s Dragon Ball. Tezuka’s manga would later be adapted into a feature film by Toei Animation, called Saiyu-ki, which was later dubbed and released in America as Alakazam the Great. Even though Osamu Tezuka is credited as a co-director (along with Daisaku Shirakawa and Taiji Yabushita), he later claimed in an interview that he only showed up at the studio to pose in publicity photos and had no involvement otherwise. 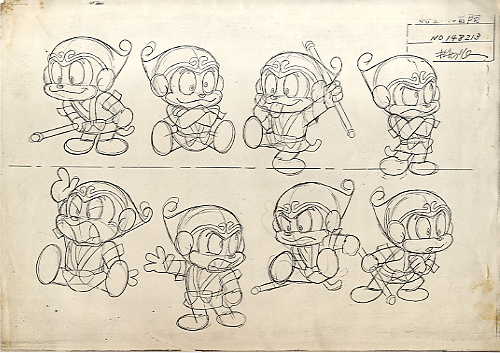 Still, the feature inspired Tezuka to seriously pursue animation, leading him to start Mushi Production as a direct competition with Toei. It was only a matter of time before Tezuka’s take on Goku would get a second chance in animation, this time for television. Tetsuwan Atom (Mighty Atom aka Astroboy), which began on New Years Day 1963, ended its run on December 31, 1966 after almost exactly 4 years with 193 episodes. Naturally that meant Fuji Television needed a replacement cartoon for its 7PM Tuesday evening slot. Like Astroboy, the replacement show will also be produced by Mushi Production. 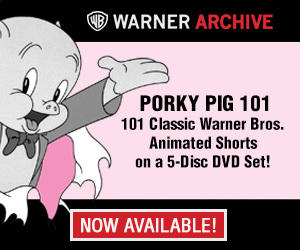 Unlike Astroboy, however, this replacement will air in color. With that, Goku no Daiboken (Goku’s Big Adventures) began airing exactly one week after the final Astroboy episode aired, on January 7, 1967. 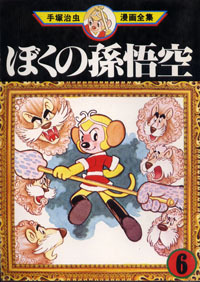 Tezuka was normally involved with anime adaptations of his work done at Mushi. 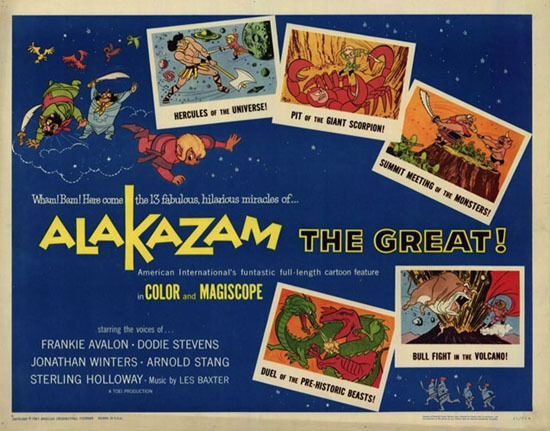 In fact, he wrote and directed numerous episodes of those shows himself, including Astroboy. However, with Goku, he had little to no involvement. In fact, this is a Tezuka anime in name only; he’s not even credited in the opening title sequence. The real visionary behind this show was Gisaburo Sugii (born 1940). Sugii, who directed several episodes of Astroboy, was assigned as a series director for Goku. Around this time he founded his own company, Art Fresh, which handled the show’s production on behalf of Mushi (they were listed as a “co-producer” in the titles). Supposedly Sugii’s Art Fresh was located in one of the ten rooms in an abandoned kindergarten that Mushi purchased to produce this show, their studio building no. 5. Writing-wise, there’s very little resemblance to the Tezuka comics as well. While his comics always had gags and humorous moments, Goku was a very wild, wild show. 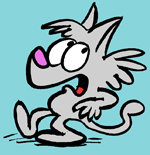 Characters constantly broke the fourth wall; wild takes were common; there was a liberal use of animation gags; the characters would frequently recite puns and non-sequiturs. In short, this is a very cartoony, wacky show, with little semblance of seriousness. It still had the characters from the original story (Goku, his “girlfriend” Tatsuko, Hakkai the pig, the Buddhist Monk, Sha Gojo), but their personalities were exaggerated: Goku is a spoiled brat with a short temper; Tatsuko is a jealous girlfriend; Hakkai constantly eats whatever he can find; Sha Gojo is a treasure hunter/thief who will go after whatever’s remotely valuable. The Monk is the only character with a semblance of normalcy, and even that gets exaggerated for comedic effect. In addition the the then 26-year old Gisaburo Sugii as a series director, individual episodes were directed by Osamu Dezaki, Hideo Nishimaki, Masami Hata, Hideaki Kitao, Ryosuke Takahashi, Norio Hikone, Toshio Hirata, and Sadao Tsukioka. Special mention should go to Sadao Tsukioka (born 1939), who not only directed episode 21, but did every single animation himself (he also single-handily animated other episodes directed by others). Goku’s Big Adventures only ran for 39 episodes, the final one airing on September 30, 1967, after just 9 months of broadcast. It wasn’t the most successful of the Mushi Production show, but it was just as ambitious as Astroboy and Kimba the White Lion. It’s an early example of a wild, goofy anime, and as with most Mushi output from the era, it’s a wonderfully designed and styled show. It’s youthful rebellious nature was a nice change of pace and the best episodes still hold up to this day. As I wrote above, Tezuka had no involvement in this show, but in this case, I think it worked out for the best. Here’s the first episode of the show, directed by Osamu Dezaki. Quite possibly the funniest episode of the show was the fourth one, directed by Osamu Dezaki. In it, Sha Gojo finds a map that contains hidden treasures. While resting at a nearby town, three warring groups (one inspired by American Westerns, another Arabian, and the last French army) they do everything possible to get the map. It’s a very cynical episode, with the three group’s men constantly getting killed left and right like it’s nothing. For a 1960s-era TV cartoon this may very well have the highest number of death counts imaginable. This is a good example of effective limited animation, with the fast-paced timing and quick cuts. Click here to see Part 2 and Part 3. That’s Astro Boy, not Astroboy. And everybody forgets Sandy. In the original 16th century “Journey to the West”, the characters were Goku, Pigsy, Sandy the sand demon, Tripitaka the Buddhist monk, and a dragon who ate Tripitaka’s horse and was forced by Goku to replace it with himself. In “Alakazam the Great”, they left out the dragon to simplify the story. In “My Son Goku”, they left out the dragon and Sandy to make room for Tatsuko, the girl friend. It’s interesting what wiggle room there was in the tale to allow for these liberties to happen with the characters. thanks for reviewing this series. I had seen clips of it on the internet, and was interested, but resisted purchasing the dvd collection, as it looked a bit too mainstream for my tastes, but after reading your review and looking at the beautiful clips I couldn’t resist. in other news. I finally finished watching the wolf boy ken collection; there were a lot of interesting experimental pieces of animation in the series as it towards the end. I also finished watching the pikkari bee series. it was poorly animated, with often clichéd writing; ne’er the less I I was totally hooked on it. I wish I could find info on its creator, and an wish I could find a collection of the manga that it was based on. also wish I could get my hands on the series “it’s a fight” (which I THINK was also created by the pikkari bee artist) … it was collected on dvd but is out of print. used copies are for sale in japan, but haven’t found a seller that will ship to the states. I finally got down to watching Alakazam the Great the other week. While I love me some Toei toons from back then (I’m crazy for Magic Boy and Jack and the Witch) they really had to murder the story to whittle it down to less than ninety minutes…but the fact that they actually cram Goku’s early story AND some monkey romance AND multiple songs into the beginning of it really sunders Pigsy and Sandy’s stories down to little more than “I am bad. I am defeated. Please don’t kill me! …Thank you, I am reformed and devoted now!” Tripitaka (“Prince Amat”) is nothing more than a persistent cameo without a trace of philosophy to share. On the other hand, China’s Havoc in Heaven, focusing strictly on Goku’s pre-imprisonment/pilgrimage days, tells its story leisurely and beautifully and if you can get it with English subs, I recommend it highly. Havoc and Nezha Conquers the Dragon King are beautiful animated masterpieces the likes of which China would never see again. The later characterizations do get thrown out the door there. We just need to finish the story as I see it. Let alone an English adaptation that pretty much retold the story differently anyway since none of us in the 60’s would have ever heard or read the tale to begin with. No kidding there, they at least know how to tell their tales well when they have it. I feel like for a true adaptation of “Journey To The West”, you’re looking at trying to stretch it out to a TV series of dozens and dozens of episodes (and more), just to cover the length of the story alone. There was of course a familiar live-action version of the tale that had a bit of a following in the UK with a kickin’ tune by Godiego. There’s a good podcast review that details “Saiyuki” and how it inspired and sometimes worked into several filler episodes of Dragon Ball. I feel like for a true adaptation of “Journey To The West”, you’re looking at trying to stretch it out to a TV series of dozens and dozens of episodes (and more), just to cover the length of the story alone. 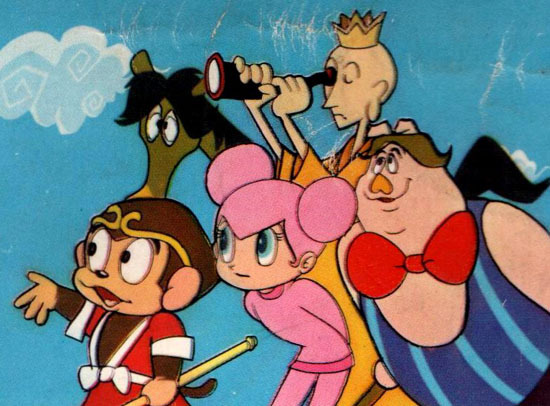 Incidentally this wouldn’t be the last time the Monkey King shows up in something Tezuka either had a hand in or not. Shortly after his death in 1989, a TV special made for a annual telethon/charity would feature Son Goku in a space adventure with an environmental theme of sorts. This story though is padded with an opening sequence featuring Tezuka in his boyhood being influenced into cartooning and the Monkey King after having watched Wan Laiming’s Princess Iron-Fan. This used to come on on Cartoon Network Japan late at night. I wondered why they change the design to Goku from his manga design to that in the anime…. Great stuff as always and a getting to see a model sheet is always nice to. I thought I’d also share a few panels from the original Tezuka comic where Goku basically fights Popeye who has been sent to defeat him. Here’s another one of Tezuka’s characters fighting Donald Duck and stealing his clothes. The article itself is about Tezuka’s relationship with not just American animation but comics as well. You come to realize how obvious it can be for those outside the US to have drawn inspiration from our own domestic characters and stories! You can see the pattern persist in many countries.